In our Instagram feed, we sometimes share RTW (ready-to-wear) looks that we come across that would be easy to recreate with a Blank Slate Pattern. Here is one way to interpret the Valetta Top pattern. 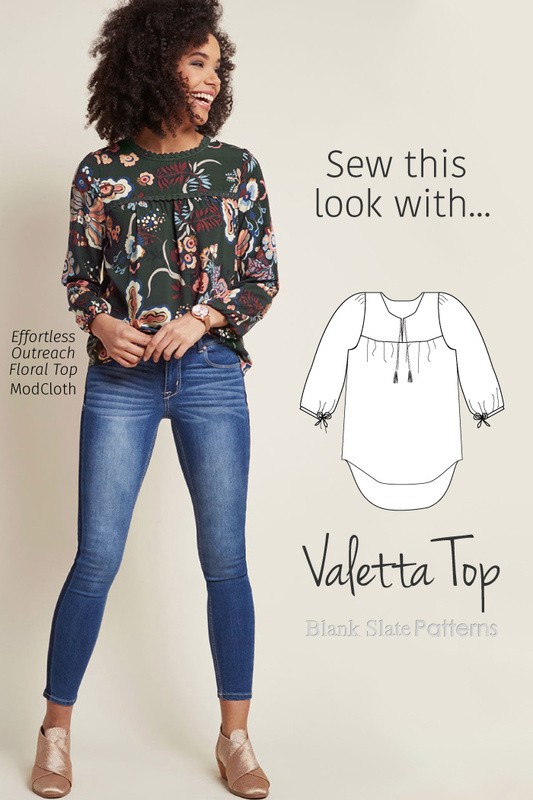 Want to highlight some trim on a Valetta peasant top? On the front yoke piece, remove the center seam allowance and cut the fabric on the fold (like in this version). NOTE: The Valetta neckline is slightly more open than this inspiration photo, so it will slip on over your head even without an opening. But if you like, you can add a center back seam allowance and construct it like the front in the instructions. Instead of the tassels, use a button and loop. If desired, straighten the hemline from the bottom of the side seam over to center front and center back, to get the look shown here. In the Yoke instructions on page 8, after sewing the shoulder seams, baste the trim to the right side of the yoke lining, stitching around the neckline just inside the 1/2″ (12mm) seam allowance. Proceed with sewing the yoke to the yoke lining around the neckline. After basting the yoke layers together at the lower edges, baste the trim to the (outer) yoke, right sides together, stitching around the neckline just inside the 1/2″ (12mm) seam allowance. You can do this on just the front or on both the front and back. Proceed with the rest of construction.